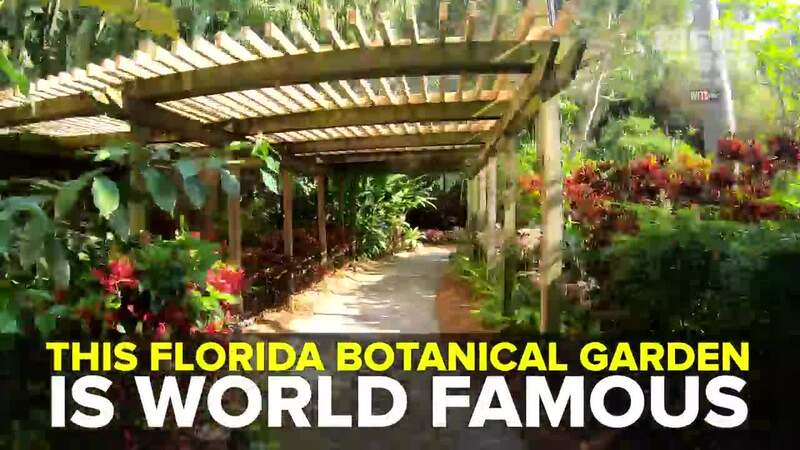 Tucked away off 4th Street in St. Petersburg, you'll find one of Florida's best botanical gardens. Known as St. Pete's oldest living museum, the Sunken Gardens has showcased nature's beauty as a roadside attraction since 1903. This botanical paradise features cascading waterfalls, flamingos, a butterfly garden, the oldest royal palms in Pinellas County, and more than 50,000 types of tropical plants and flowers. ST. PETERSBURG, Fla. — Tucked away off 4th Street in St. Petersburg, you'll find one of Florida's best botanical gardens. Known as St. Pete's oldest living museum, the Sunken Gardens has showcased nature's beauty as a roadside attraction since 1903. This botanical paradise features cascading waterfalls, flamingos, a butterfly garden, the oldest royal palms in Pinellas County, and more than 50,000 types of tropical plants and flowers. You can certainly escape the city life while strolling through meandering paths, lush with exotic plants from around the world. "Everything is so tranquil and peaceful here," said Doug Maguire, UK tourist. "You come here and lose yourself. You're in a jungle inside a city." Be sure to pack a picnic lunch and bring the camera so you can make a full day exploring the garden. Discover the beauty of Sunken Gardens at 1825 4th Street North, St. Petersburg. Click here for more information.